There has been a huge impetus given to bioinformatics that has provided an underpinning to the accelerated discovery and insights in molecular structure with an impact on genomics in the last 15 years. The most notable is an Israeli metallurgical physicist and crystallographer, Daniel Schechtman, who did his most important work at the National Bureau of Standards, recipient of the 2011 Nobel Prize in chemistry. He is a Professor of Chemistry at Technion University and the fourth Israeli scientist to receive the recognition since 2002. The achievement was so remarkable that the work was initially discredited as violation of established laws of crystal structure that were proved to be incomplete. In 1619 the great German mathematician and astronomer Johannes Kepler paid his attention on the sextuple symmetry of snowflakes. He attempted to explain of its nature by the fact that the crystals are constructed from the smallest identical marbles, which are connected closely one to another. Subsequently many great minds made many efforts to uncover the secret of crystals. According to the main law of the crystallographic symmetry that came to be accepted it is possible for the crystals only the symmetry axis’s of the first, second, third, fourth and sixth orders. The main crystallography law rejects a possibility of the symmetry axis of the fifth order in the crystallographic lattices. 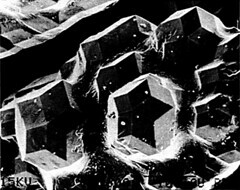 The essence of the discovery is that crystals have repeating patterns, but Schechtman’s examination of the crystallography of a synthetic alloy did not fit that requirement. He identified an Icosohedral Phase, which is referred to as quasicrystals. The alloy of the aluminum and the manganese discovered by Shechtman is formed at the super-fast cooling of the melt with the speed 106 K per second. Thus there is formed the alloy ordered in the pattern, which is characteristic for the symmetry of the regular icosahedron having alongside with the dodecahedron the symmetry axes of the 5th order. 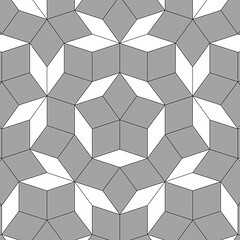 The tiling of a plane in a non-periodic fashion was first noted in 1963 (Wang tiles), and then in 1976, Roger Penrose proposed a set of non-periodic tiles referred to as Penrose tiles. Penrose was engaged in the “parquet’s problem” consisting of the dense filling of the plane with the help of polygons. In 1972 he found the method to cover flatness only with two simple polygons arranged non-periodically. In their simplest form “Penrose’s tiles” represent a nonrandom set of the diamond-shaped figures of two types, one of them is with the interior angle of 36°, the other one with the angle of 72°. Just as simple curves in a plane can be obtained as sections from a three dimensional double cone, aperiodic arrangements were obtained from hyperlattices with four or more dimensions. The pentagram has a number characteristic of isosceles triangles. Take the triangle of the kind of ADC, where the acute angle at the vertex of A is equal to 36° and the ratio of the side AC = AD to the base DC is equal to the golden proportion, that is, the given triangle is the “golden” one. 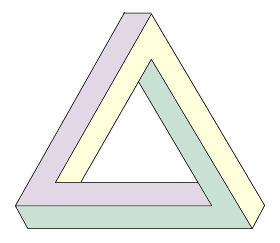 If we combine two such triangles so that their bases coincide, we will get “Penrose’s rhombus”. Another type of the isosceles triangle is available in the pentagram, for example, EBK. It has the acute angles at the vertex of E and B equal to 36°, and the obtuse angle at the vertex of K is equal to 108°. 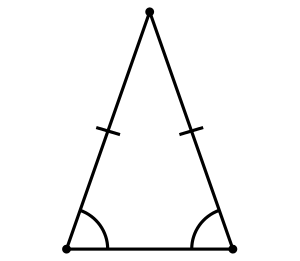 The ratio of the base EB of the triangle EBK to its side EK is again equal to the golden proportion, so this triangle also is the “golden” one. If we connect such two triangles together so that their bases coincided we will get another “Penrose rhombus”. 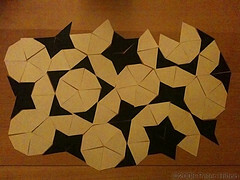 “Penrose’s tile” can be formed by using the “golden” rhombuses. We can cover the plane using only two “golden” rhombuses of the kinds of formed from the “golden triangles”. 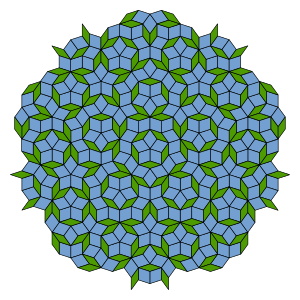 At the end, there is some non-periodic structure called “Penrose’s tile”. It was proved, that the ratio of the number of the “thick” rhombuses to the number of the “thin” rhombuses in such structure strives for in the limit to the golden proportion! 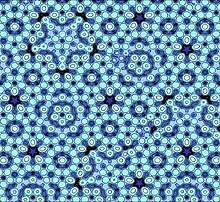 Quasicrystals don’t have a repeating pattern. 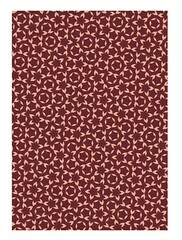 They have an Arabic mosaic pattern that relies on nonrepeating patterns. The quasicrystal is ordered but not periodic. It lacks translational symmetry, where crystals, according to the classical crystallographic restriction theorem, can possess only two, three, four, and six-fold rotational symmetries. 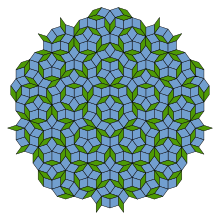 Now quasicrystals is a three dimensional analogy to Penrose’s tiles. It has been stated by Gratia (1988) that the concept of the quasi-crystal presents a fundamental interest because it extends and completes the definition of the crystal. The theory based on this concept replaces the traditional idea about the “structural unit repeated in the space by the strictly periodic mode” by the key concept of the distant order. Its significance in the mineral world can be put in one row with attachment of the irrational numbers concept to the rational ones in mathematics”. Gratia notes “the mechanical strength of the quasi-crystal alloys increases sharply; the absence of periodicity results in slowing down of the dislocations distribution in comparison to the traditional metals… ” The quasi-crystals shattered the conventional presentation about the insuperable watershed between the mineral world where the “pentagonal” symmetry was prohibited, and the living world, where the “pentagonal” symmetry is one of most widespread. This discovery came 20 years after the discovery of aperiodic crystals by mathematicians in the 1960s, but it was only later, in 2009, that finding of a naturally occurring mineral icosohedrite in the Khatyra River in eastern Russia, provided the proof for existence of naturally occurring quasicrystals and produced a paradigm shift in crystallography. The extended concept of crystal structure is that an ordering can be non-periodic because it lacks translational symmetry so that a shifted copy does not match the original pattern. Mathematically, it states that there is never translational symmetry in more than n-1 linearly independent directions. The ability to diffract is due to the existence of an indefinite number of regularly spaced elements.The asymmetry is displayed in orders other than two, three, four or six.Dan Schechtman observed the unusual diffraction patterns in Aluminium-Manganese alloys in1982. He did not publish the results until two years after his discovery. When Schechtman first made the observation he showed it to Ilan Blech, who noted that such diffraction patterns had been seen before. When Blech looked at the pattern again two years later, it was immediately clear that the common explanation was ruled out ny the experiments. Blech decided to use a computer simulation to calculate the diffraction intensity from a cluster of such a material without long-range translational order but still not random. He termed this new structure multiple polyhedral. the computer simulation showed sharp ten-fold diffraction patterns, similar to the observed ones, emanating from the three-dimensional structure devoid of periodicity. The multiple polyhedral structure was termed later by many researchers as icosahedral glass but in effect it embraces any arrangement of polyhedra connected with definite angles and distances. At he request of John Cahn, a final paper, “The Microstructure of Rapidly Solidified Al6Mn” was submitted and accepted in the Physical Review Letters, which caused considerable interest. This natural quasicrystal exhibits high crystalline quality, equalling the best artificial examples. The natural quasicrystal phase, with a composition of Al63Cu24Fe13, was named icosahedrite and it was approved by the International Mineralogical Association in 2010. On further analysis it was thought to meteoritic in origin, possibly from a carbonaceous chondrite asteroid. In 1992 the International Union of Crystallography altered its definition of a crystal, broadening it as a result of Shechtman’s findings, reducing it to the ability to produce a clear-cut diffraction pattern and acknowledging the possibility of the ordering to be either periodic or aperiodic. A Fibonacci crystal or quasicrystal is a model used to study systems with aperiodic structure. Fibonacci ‘chains’ or ‘lattices’ are synonyms used with regard to the dimensionality of the model. The elements of a Fibonacci crystal structure are arranged in one or more spatial dimensions. The Fourier transform of such arrangements consists of discrete values, which is the defining property for crystals. This feature guarantees that its Fourier transform is discrete.The Fibonacci-based constructions have a diffraction pattern with the intensities arranged in a fractal pattern. This discussion is not complete without mention of another giant of modern physics who received the Nobel Prize in Chemistry 1977. He was born in Russia in 1917, and his family moved to Germany, moving again to Belgium in 1929. His notable work was in Statistical Mechanics and Thermodynamics. He established the Center for Statistical Mechanics and Thermodynamics, which later became the Center for Complex Quantum Systems in Austin, Texas in 1967 after leaving the Enrico Fermi Institute at the University of Chicago, where he was from 1961-1966. He is well known for “Order Out of Chaos”, and “End of Certainty” (1997), written with Isabella Stengers. He developed his “dissipative structure theory” to account for self-organizing systems, which might well be considered complexity theory. Prigogine viewed Newtonian physics as limited, then extended by the wave function in quantum mechanics, and then again with the introduction of spacetime in general relativity. He concluded that the recognition of indeterminism is essential in the study of unstable systems, particulary because the initial state is not known, and the problem of “time’s arrow”. He studies determinism in nonlinear systems, defining Liouville space, a vector space formed by linear operators mapping into Liouville space, but not every adjoint operator maps into a Hilbert space. He was strongly influenced by Boltzmann and by Turing. He distinguishes between the behavior of gases in terms of populations of particles and the concept of behavior of individual particles. Accordingly, in deterministic physics, all processes are time-reversible, meaning that they can proceed backward as well as forward through time. But in statistical mechanics gases undergo irreversible processes. Prigogine declared that determinism is fundamentally a denial of the arrow of time. With no arrow of time, there is no longer a privileged moment known as the “present,” which follows a determined “past” and precedes an undetermined “future.” With irreversibility, the arrow of time is reintroduced to physics. He notes that irreversibility includes diffusion, and the emergence and evolution of life. He concludes that organisms are unstable systems existing far from thermodynamic equilibrium. Instability resists standard deterministic explanation. This view appears to have much relevance to an understanding of disease, mutation, adaptation, and aging as we learn more about the interactions between cells, between organelles within cells, and in genomic regulation. The process of genomic evolution cannot be revealed throughout comparative genomics as structural data representation does not illuminate either the integral path of particles-light interference, as Richard Feynman suggests, in stable forms of matter such as interference/entanglement of the nature of particles/strings/waves to first approximation as I have claimed. Towards the compressibility principle realization, I have claimed that DNA would be entropic- favorable stable state going towards absolute ZERO temp in the space defined itself. In other words themodynamics measurement in subnano discrete space would go negative towards negativity. DNA is sort of like a cold melting/growing crystal, quite stable as it appears not due to hydrogen bonding , but due to interference of C-N-O. That force is contradicted via proteins onto which we now know large amount of negative quantum redox state carbon attaches. Chemistry is just a language as it is math following certain rules based on observation. Most stable states are most observed ones. The more locally one attempts to observe, the more hidden variables would emerge as a consequence of discrete energy spaces opposing continuity of matter/time. Still, stability emerges out of non stability states. And if life was in absolute stability, there will be neither feelings nor freedom. What is feelings and freedom is a far reaching philosophical question with sets of implications, to one may be a driving car, to another riding a horse or a bicycle etc cetera or simply seeing the unobservable …No wonder genome size differs among organisms and even tissue types as an outcome of carbon capacity. Prigogine reference is correct as the best definition of life as a dissipative system that extracts change in free energy from outside and transforms this change in free energy in order. A definition that also correctly inserts life in our classical thermodynamics and therefore, is far better than what arises from molecular biology : Living organisms are capable of self-replication. However, it does not provide explanations for some unexpected results in chemical reactivity that seems to require considerations that are outside classical thermodynamics. In order to explain these additional points it is necessary to take into account conformational energy of R A Marcus (See J Electroanalytical Chemistry 438(1997) 251-259). Marcus approach, will use a rather simple system to offer the basis to reconcile these exceptions with classical thermodynamic and also allows for our initial steps to understand another aspect of life: self-organization( Science:279:1891-1895 (1998). None of these aspects can be solved by genomic data plus informatics. Another aspect : “DNA is sort of like a cold melting/growing crystal, quite stable as it appears not due to hydrogen bonding , but due to interference of C-N-O.” DNA stability is due to several other aspects of its structure.for instance Pi (Greek letter pi) electrons of stacking of flat sugar molecules. However, it is its hydrogen bonding that places puric bases in front of pyrimidic ones and vice versa that causes its biological determinism, both, when it is doubled or when copied into RNA that later will inform amino acid order of proteins. It is the determinism that impressed so much Erwin Schrödinger in the case of the Habsburg dynasty (obseved from 1459 to 1895) and its lips. When DNA was not proven to be the repository of genetic information Schrödinger ask himself what molecule in biology was so stable in an environment under constant oxide-reductive processes. The biological stability arrises from hydrogen bonds that place the coding capacity of DNA inside its molecule. I have always enjoyed reading Richard Feynman but with all his lack of information at his time Schrödinger was better as approach to the subject.